Darlene Fudge-Richard shelters and feeds a cat she has never touched. The Eastern Passage homemaker has turned her backyard into a sanctuary for feral cats. One has been living on her property for about seven years. She even cut a hole in her fence to ensure the cat can enter and leave the yard with ease. “I think that the cats in my yard talk to their friends and tell them to come. ‘You get a warm meal over here, and a nice warm place to sleep,’” Fudge-Richard says with a laugh. She took in the feral cat almost seven years ago as part of a program called TNR – trap, neuter, return. Sonya Higgins, who runs Healing Animal SCARS – Sonya’s Cat and Animal Rescue Society – captures, and provides veterinary care for stray cats. 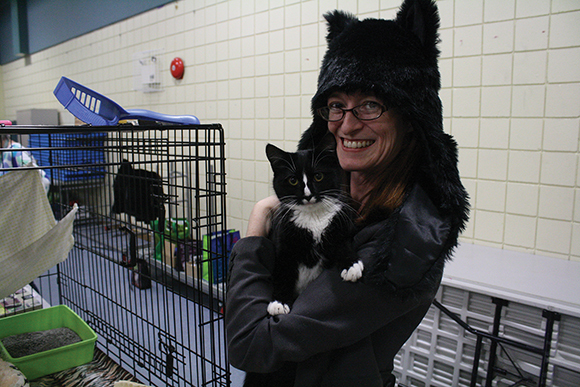 Since she started the society in 2006, Higgins estimates she has taken in more than 700, many of them feral. Feral cats are “descended from domestic animals that, due to human neglect, have been forced to live as wild animals,” according to the Canadian Federation of Humane Societies. The TNR method, which is promoted by animal associations across North America, involves neutering and vaccinating feral cats and returning them to the locations from which they were taken, in an effort to control and reduce the population. A 2009 report estimated there are between 40,000 and100,000 feral cats in the Halifax area. Sandra Flemming, the provincial animal care director with the Nova Scotia SPCA, says TNR is a vital part of dealing with cat overpopulation. The only other option for dealing with feral cats within city limits is euthanization. At Meow Movers, an event held last weekend at the North Dartmouth Community Centre, Healing Animal SCARS was one of many booths selling cat toys, crafts and used clothing to raise money for shelters and rescues. Higgins uses donations primarily to cover veterinary costs. Last year alone, vet bills for the 138 cats she took in came to almost $33,000. Those cats were treated at Eastern Passage Village Veterinary Hospital where veterinarian Dr. Courtney Sherlock says Higgins’ society is doing great work. Besides controlling the number of stray cats, Sherlock says bringing them in allows her to check for, and treat, health problems such as feline leukemia or worms. The vet also administers vaccines as required. Adoption is the ideal option for the strays Higgins takes in. But if the cat is too wild, it enters the final stage of the TNR process. This last step, returning the cat to the place where it was found, is done with the help of volunteers like Fudge-Richard, who own the property on which the cat was living. An outdoor shelter is erected, and the volunteer is responsible for putting out food and alerting Higgins to any apparent health problems in the future. But not everyone is as dedicated as Fudge-Richard. Higgins says people are sometimes resistant to the idea of allowing a wild cat to make its home in their yard. They have a dog, or young children, or they simply don’t like cats. Often Higgins is able to bring them around to the idea. She explains that a neutered male cat, having laid claim to one’s yard, will keep other cats away. As well, a neutered cat is unlikely to howl and fight. She also mentions rodent control. Higgins shares her own home with five cats, a dog named Porkchop and four foster cats awaiting homes. Higgins used to have a government job, but now she rescues cats full-time. “I’d rather be at home working with animals and not getting paid,” she says. “Right now, the animals need me. Originally published in the Halifax Commoner and on their website.